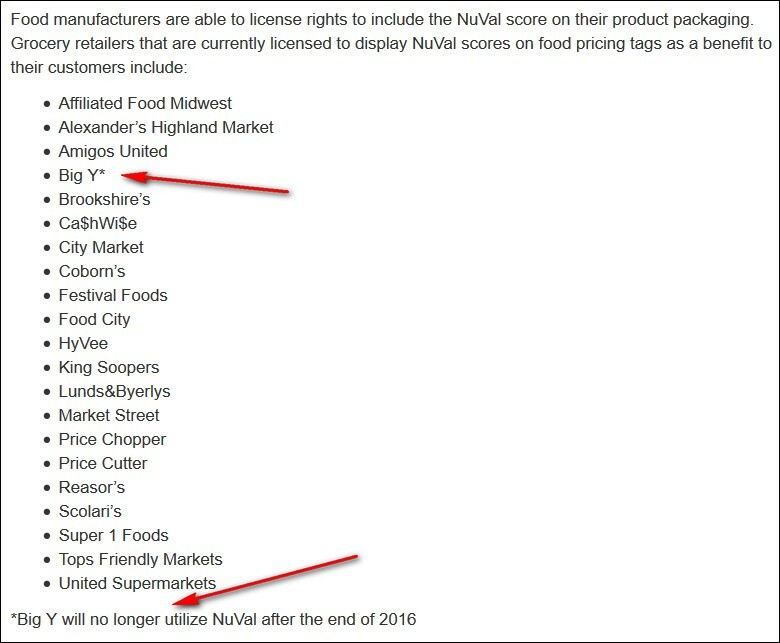 [New England supermarket chain] Big Y adopted NuVal, a service that assigns numerical scores to food products based on their nutritional value, six years ago as part of an effort to promote healthy eating habits. But last April the chain dropped NuVal because of concerns that its ratings algorithm was out of date. ...Claire D’Amour-Daley, chief communications officer for Big Y, told the News that the chain dropped NuVal because the algorithm is out of date and customers are increasingly able to make savvy nutritional decisions on their own. Last week I came across Coming to a Grocery Store Near You: The NuVal System, a September 22, 2016 article by Elaine M. Hinzey, RD, LDN published by Nutrition411.com, described in a a 2014 press release as "a vibrant news source and clinical resource center designed for healthcare professionals who integrate diet and nutrition into patient consultations." I have looked into this and consulted with...(an) expert on the Nutrition411 editorial board...I have decided to add an asterisk next to Big Y with the caveat that “Big Y will no longer utilize NuVal after the end of 2016.” (According to sources), “Big Y is stepping away from NuVal and has started to phase it out. The process did begin several months back. 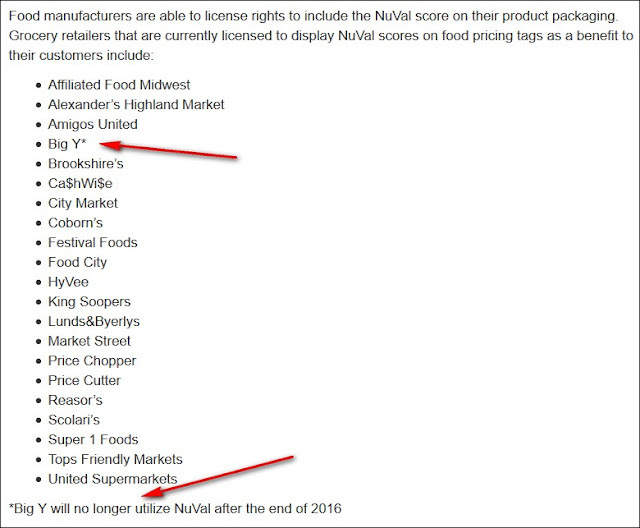 However their NuVal licensing contract runs through the end of the year which is why their logo still appears on the NuVal website.” I also included a link in the references to the Yale article if people want more information. If you want to check out the updated version of the article, you can go to http://www.nutrition411.com/articles/coming-grocery-store-near-you-nuval-system. Why is this interesting and/or newsworthy? A 2007 report called the nutrition scoring algorithm, "An unfailing, ever reliable guide to better nutrition both within and across food categories." So how do these renowned scientists respond to Big Y's opinion that their system has gone the way of the buggy whip? To my knowledge no one has asked.